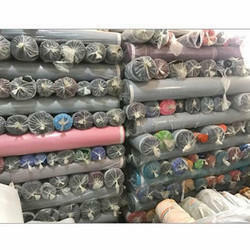 Prominent & Leading Wholesale Trader from New Delhi, we offer georgette plain fabric lot, sportswear fabric ns lot, yarn dyed check fabric, taslon lot fabric and yarn dyed stripes fabric. 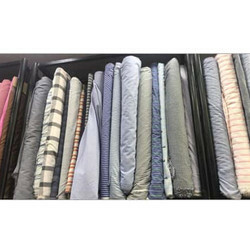 As a quality-oriented firm, we are focused to offer our customers excellent quality Georgette Plain Fabric Lot that is used to make attractive outfits. This pain fabric is made with the use of excellent quality yarns, threads and advanced technology. The stylish pattern and shades of this plain fabric make them high on demands and can purchase at reasonable rates from us. According to the taste of clients, we offer entire range of Georgette Plain Fabric Lot in different vibrant colors and attractive patterns. With the extensive knowledge and experience in this respective industry we are engaged in offering optimum quality NS Lot For Sports Pant Fabric. The offered fabric is widely used for designing sports pant. The given fabric is weaved by our adroit designers using supreme grade threads and newest weaving machines. 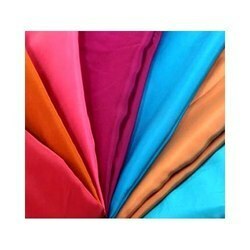 This fabric is known for its qualities like shrink resistance, stylish look, easy to iron and colorfastness. Furthermore, our NS Lot For Sports Pant Fabric is available in varied style and patterns as per the requirements of our buyers. Supported by experienced designers, we are providing a beautiful collection of Yarn Dyed Check Fabric that is used to make attractive outfits. This check fabric is woven by a deft team of professionals using quality checked plain yarns at our very advanced premises. The given check fabric is known for its qualities like beautiful texture, good color retention, smooth stitching and weather proof. In addition to this, the offered Yarn Dyed Check Fabric is widely demanded in the market due to their optimum quality and skin friendly nature. 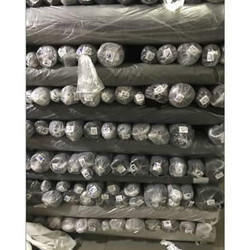 Our domain expertise has enabled us to come up with a wide assortment of Taslon Lot Fabric. The offered fabric is stitched by creative team with the use of the optimum quality and skin-friendly threads at our well advanced production setup. This fabric is appreciated for its shrink resistance, colorfastness, fine finish and beautiful look. In addition to this, the offered Taslon Lot Fabric finds wide range of usage in garment industries for making garments of both men and women. Being one of the reputed organizations in the industry we are engaged in providing an exclusive Yarn Dyed Stripes Fabric. Our artisans competently design this strip fabric with superior quality cotton threads and yarns. Our clients prefer this strip fabric for its soft texture. Wide range of fabrics is also there in a variety of patterns, textures, designs and colors. This Yarn Dyed Stripes Fabric is known for its qualities like colorfast nature, smooth finish, stylish patterns, high tearing strength and shrink resistance.